On the first full day of our visit, Szymon and Jan took the UK group to Majdanek, a German concentration and extermination camp built and operated by the SS on the outskirts of the city of Lublin during the German occupation of Poland in World War II . . .
Maybe it is connected to Poland’s current right wing government, who are pushing through a law that will punish anyone with prison time for accusing Poland for taking any part in the atrocities of the Holocaust. There were victims, there were resisters but there were also those who were complicit. Visting Majdanek Concentration Camp with Szymon and Jan from the Well of Memory Association. On arrival, the first thing that struck us was that Majdanek concentration camp is situated in an urban area, close to the city centre of Lublin. It can be seen from all sides. It is public and accessible. It is located in an entirely open area with no trees around it to hide the activities inside the camp, as at Dachau. There was no security zone established around the Majdanek camp, as at Birkenau, and there is no natural protection, such as a river or a forest, as at Treblinka. People driving past the camp, while it was in operation, had a completely unobstructed view, able to see the tall brick chimney of the crematorium wafting smoke from the top of a slope not far away, and the gas chamber building which is very close to the street. It was a very cold and wet day and we could not help thinking about the terrible conditions people endured. The huts were constructed cheaply, often colder inside than outside. The message we took away was that the Nazis did everything in their power to humiliate, denigrate and dehumanise the Jewish people. Ordinary people, who were trustworthy, kind, neighbourly and hard working before the war, became capable of doing extraordinarily evil things. Polish people living in Lublin, under threat of being interred themselves, became part of the killing machine or ignored it, in order to save their own lives and the lives of their families. What would we have done in their place? Would we have remained silent or turned a blind eye? There were many crows in evidence during our visit, appropriate hosts and guardians of the stories literally buried there. The tour guide Flavio, who sensitively guided us around the camp, said they are always present here, as if to give further warning to visitors. 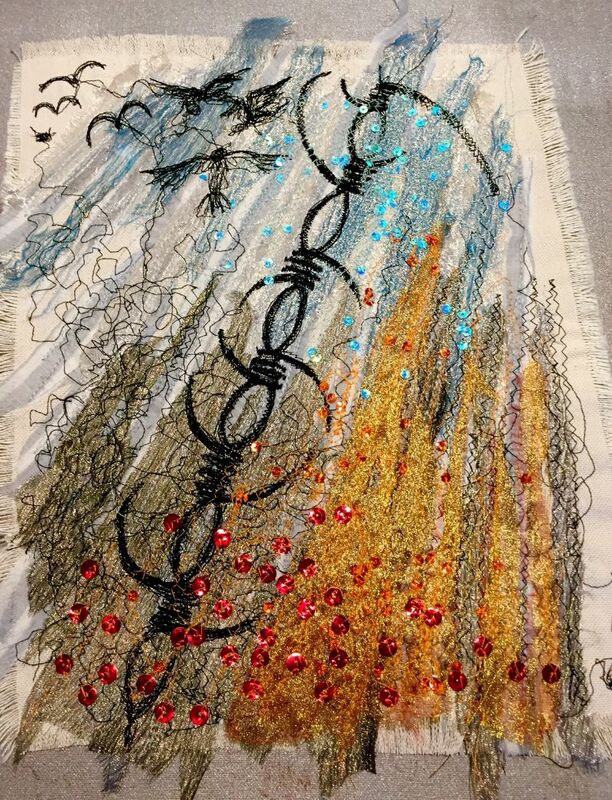 We were greatly moved and inspired by the efforts of the prisoners to create subversive artwork in the camp, using scraps of building materials or found objects. The human spirit is ultimately indomitable. An unexpected sight was a large group of Israeli young people wearing white jackets with the Star of David on their backs and carrying huge flags. They were accompanied by security men dressed in black. We thought they might be there for an anniversary event or ceremony. Szymon and our guide Flavio explained that Israeli school students, who can afford to, visit the camps as part of their education, which means that Majdanek and the other camps in Poland are visited by literally thousands of Israeli young people. Sadly, we are told, the young people are often briefed by their teachers before they arrive, to believe that Polish people in general are not their friends, or to be trusted, as they allowed the Holocaust to happen or were complicit. This might explain why they looked so intimidating and openly hostile, in spite of our efforts to smile and say hello. It felt that for them, anyone outside their group was potentially anti semitic. We were quiet and respectful. They were noisy and posing for photographs, waving the flags, running in and out of the barracks, getting in the way of the interpretation boards, laughing or looking bored. They were whisked away by their minders from elements of the camp that referred to the non Jews who were interred, tortured and murdered there. We were very disturbed and confused by this incident and wanted to understand more about his behaviour. Later, we read that some schools in Israel are worried about these trips because they are encouraging a culture of blame and hatred amongst the young, and also reinforcing Israel’s message about the necessity for a military state. There is a related article in Time.com about a school that has chosen an alternative to these trips. It was the site where Nazis forced Jews into pointless labour, purely to demoralise them. Survivors recount stories of digging up boulders and carrying them from one side of the camp to the other, only to have to move them back to the other side of the camp the next day. We look at the evidence of a road built to nowhere, as Flavio, our guide, gives us the facts, supported by individual human stories. These are what we will remember. 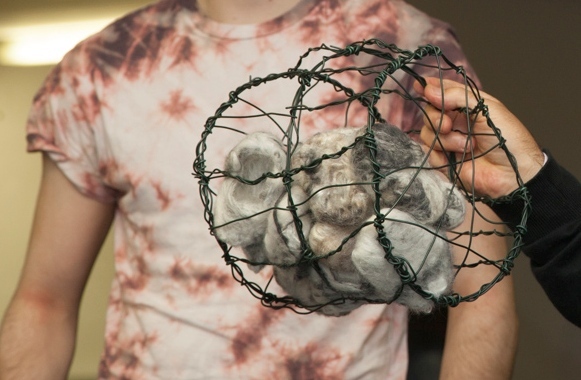 Raf created a barbed wire cage the shape of a boulder to contain small, soft, felt shoes. 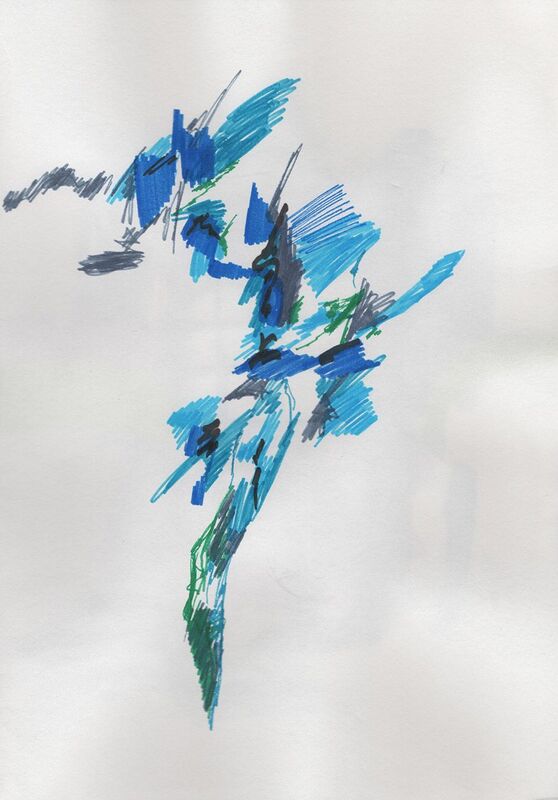 He won’t forget the vulnerable nature of shoes that once held the feet of people who walked, danced and skipped. In the first gas chamber there are heavy blue stains on the walls and ceiling, the residue of Zyklon B gas used to kill the Jews and other prisoners. Prussian blue - it’s the colour we use to paint our masks and puppet heads. The gas is absorbed quicker if the skin is warm and moist after a shower. In November 1943, villagers nearby listened to popular songs on the radio whilst the sounds of gunshots, screams and cries of 18,000 people were deafened by lively Polish polkas and marches in the camp, lasting from early morning until nightfall. It was the largest one day, one location massacre during the Holocaust . . .
We are overwhelmed by the sense of evil. Naomi points out the number of crows in the camp. Who once carried drops of jewel red blood on their feet. The human spirit is indominatable. Dotted around the camp are remains of sculptures made by the prisoners. 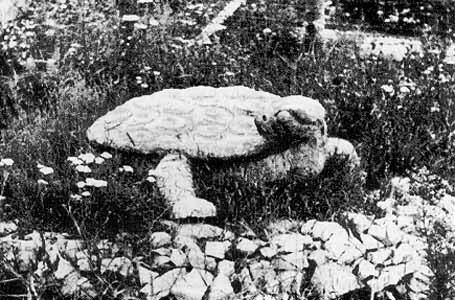 A stone tortoise, the symbol of the Polish resistance, reminds inmates to work slowly. 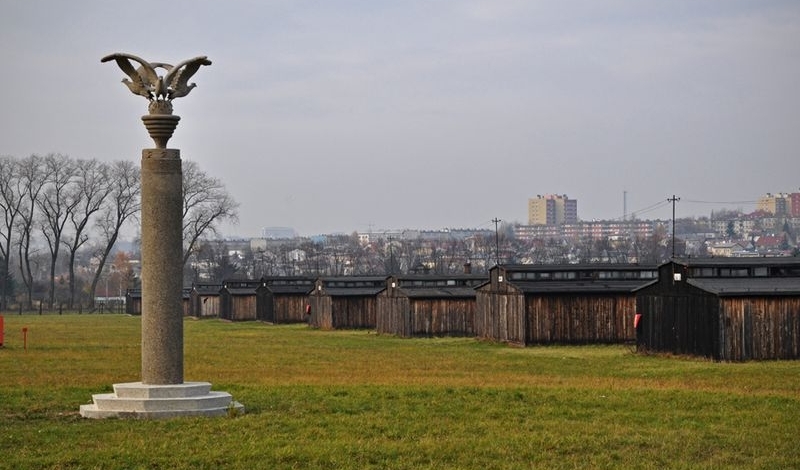 When presented with an opportunity, Polish artist and prisoner, Maria Albin Boniecki, proposed a sculpture of three eagles to the camp officials, who accepted the offer, believing the eagles were a German symbol. But the Three Eagles Column that he produced symbolised, among other things, the freedom of Poland, brotherhood, and triumph. The eagles look more like doves and some human ashes of the victims of the gas chambers were secretly placed within the sculpture. The message we took away from our visit was that the Nazis did everything in their power to humiliate, denigrate and dehumanise the Jewish people. Ordinary people, who were trustworthy, kind, neighbourly and hard working before the war, became capable of doing extraordinarily evil things. Polish people living around the camp or in Lublin, under threat of being interred themselves, became part of the killing machine or ignored it, in order to save their own lives and the lives of their families. What would we have done in their place? Would we have taken action of some sort or remained silent?